20 Fall inspired science activities & experiments for preschoolers, kindergarten & elementary age kids! Especially getting outside to enjoy the weather -- which always leads me to think about a few fun Fall themed science activities for kids. With all the seasonal changes, science in the Fall can be so easy to come by and so colorful too -- kids will typically ask questions like "why do leaves change colors? ", they look forward to making leaf rubbings and eagerly collect various nature items like pinecones & acorns for projects! So today I hope to inspire you with some seasonal science -- experiments with leaves, apples, pumpkins and more Autumn favorites! In addition to talking with kids about the seasonal changes they see around them, try a few of these hands-on activities and experiments that introduce your kids to different science concepts. We've included affiliate links to some of our favorite items that are great for exploring Autumn science too! Or if you don't have a variety of leaves in your area, try these Leaf Rubbing plates for kids with leaf guide! And you can also watch a leaf breathe with this awesome & easy experiment! Play a game with Name that Tree! leaf & tree identification activity using these free printable tags! Track migration patterns with this Bird Watching Kit for kids! Track the Phases of the Moon with these great hands-on science activites. Learn about bats with these Bat books & nighttime activities! Or explore life after dark with this FREE printable Nocturnal Scavenger hunt! Take an evening walk with these Constellations Knowledge Cards and learn about the stars in your neighborhood! Explore Citizen Scientist Projects for Kids to do at home! Learn what animals do in the Fall with these books on hibernation & migration! Create an Autumn Nature Table (The Imagination Tree) or Fall Nature Science Tray and get an up close look at seasonal changes! And if you're looking for more outdoor science, we also recommend the Outdoor Science Lab for Kids! 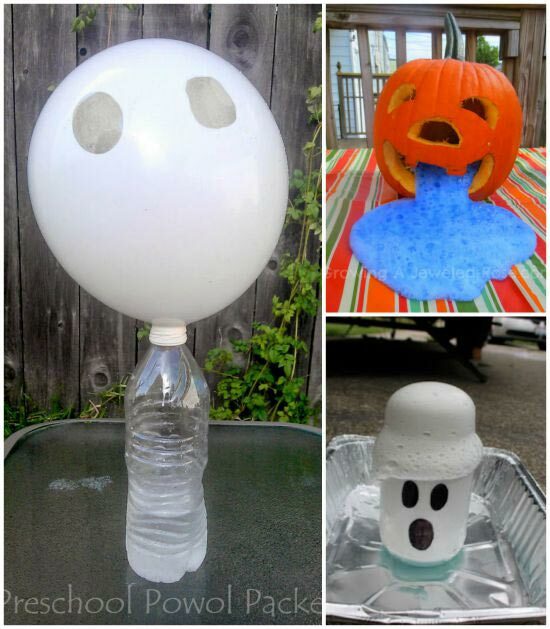 Another fun time to explore science is during Halloween so I wanted to include some bonus science activities for the holiday. Try these fun outdoor ideas for trick or treat learning -- most are perfect for a class party too! Turn a Pumpkin into a jack-o-lantern with this easy Halloween Optical Illusion! What a great resource for Fall activities! I think we are going to push back a few lessons so that we can have a full day of Fall Science Activities! Each one looks to be fantastic! Thanks for the ideas. Going to the pumpkin patch has always been one of my favorite fall activities. Looking for ideas for Fall for my preschoolers.